At Ground Zero, Families Are Exploring The New Quiet Space : The Two-Way Designed as both a park and a place of remembrance, families of the victims are already using the new memorial for both purposes. 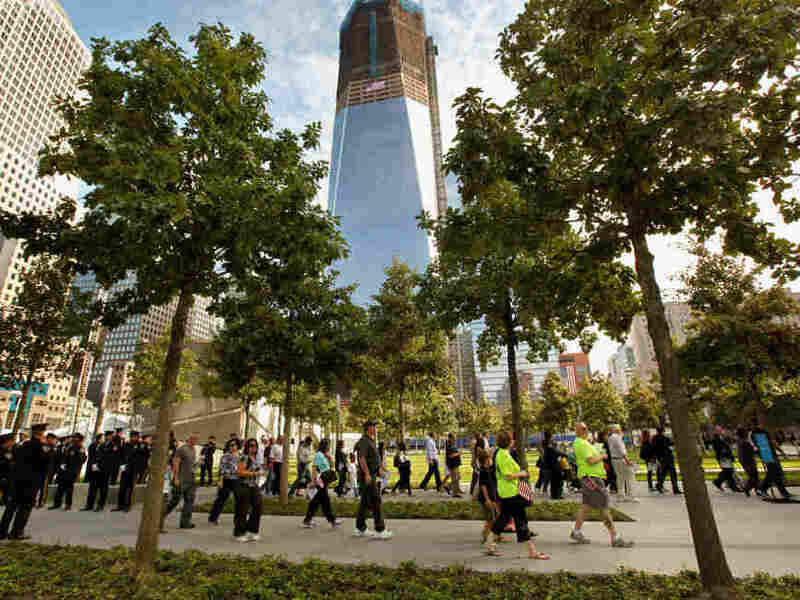 Family members of the victims entered the 9/11 Memorial Plaza for the first time today. Today, the 9/11 Memorial is open for the first time to the families of the Sept. 11 victims. Monday, the memorial opens to the public (free, advance tickets required). And while the site is a memorial to the people who died here, it will also serve as green space for New Yorkers — a park with benches, grass, and trees in contrast to the buildings of steel, glass, and concrete that surround it. Those in attendance for the 10th anniversary ceremony are already using the memorial for both purposes. While families are remembering their loved ones through the reading of names, it is also a weekend in New York. And after families have memorialized their loved ones, they are stepping away from the two huge, black fountains where the twin towers once stood and enjoying the other aspects of the memorials. People are relaxing on the benches. Children are running around the trees. Families are sitting on the grass, enjoying a snack.